While I was away on my holiday's in Queensland, I made a special trip 15 minutes down the road from where we were staying to finally meet the girls from Picture Polish face to face at Picture Polish gallery HQ. The set up there is so beautiful with banners, framed swatches and bottles, and small chairs to sit at and chat. And chat we did! I don't even remember how long I stayed and chatted, but it was so lovely to finally meet Jules and the other PP girls. You should have seen the tens of thousands of bottles that were hidden behind the walls, and all the bottles being packaged up going out to buyers and network members. It was very cool. Naturally I had to wear my Kryptonite for the occasion. The only problem was that because I was on holiday, I had only taken 4 polishes with me, plus base coat, Seche Vite top coat, cotton wipes and removers. The one thing I had forgotten to pack was a clean up brush. So when I was painting my nails the night before heading to PPHQ I had to be very, very careful to paint neatly, cause I had nothing to clean up with. Luckily it wasn't too bad (I guess I've had plenty of practice). This little corner is my corner at HQ! I've talked about it before here. There are framed swatches of my nails on the wall, plus a little plaque on the wall with some words I wrote. It was so AMAZING to see this in real life! This was has picture boxes filled with every colour they have, and on the top of each box is a nail wheel with the colours swatched. It really makes these bottles into art and fits so perfectly with the brand name of Picutre Polish! 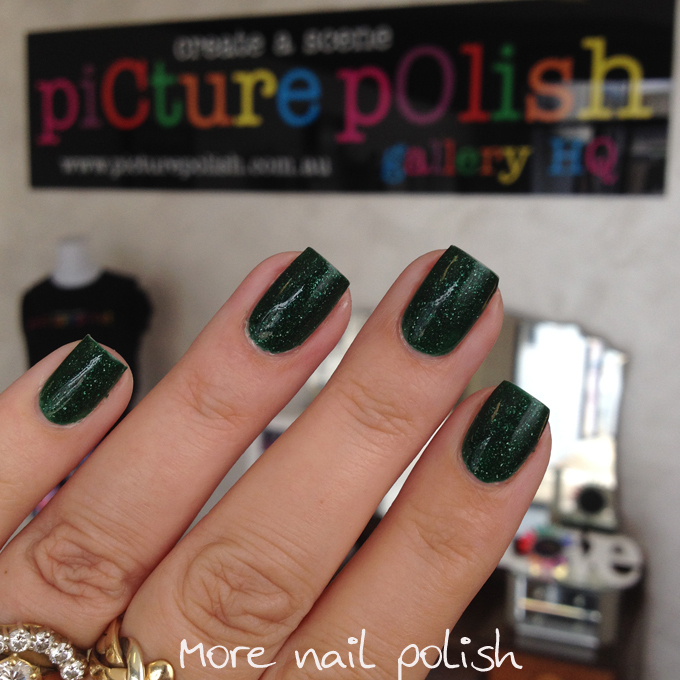 While I'm talking Picture Polish, here are a couple of comparison swatches I did a good while back. I'm such a slack blogger and really should have posted these earlier. First up is a comparison of the new reformulated version of ariel's tail. 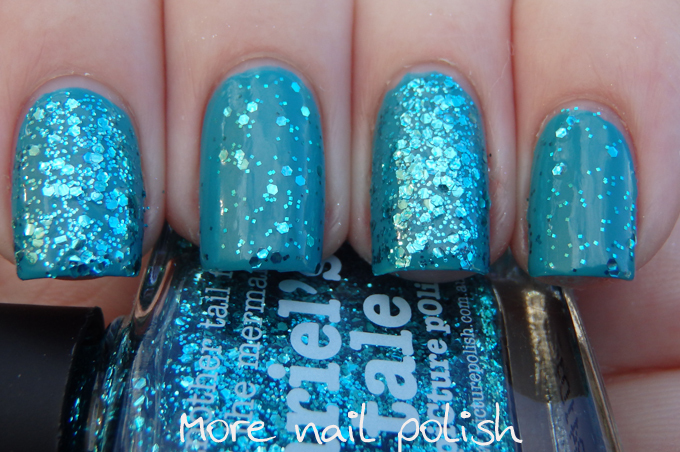 It still contains the multiple sizes of turquoise glitters, but the new version is much more densely packed. 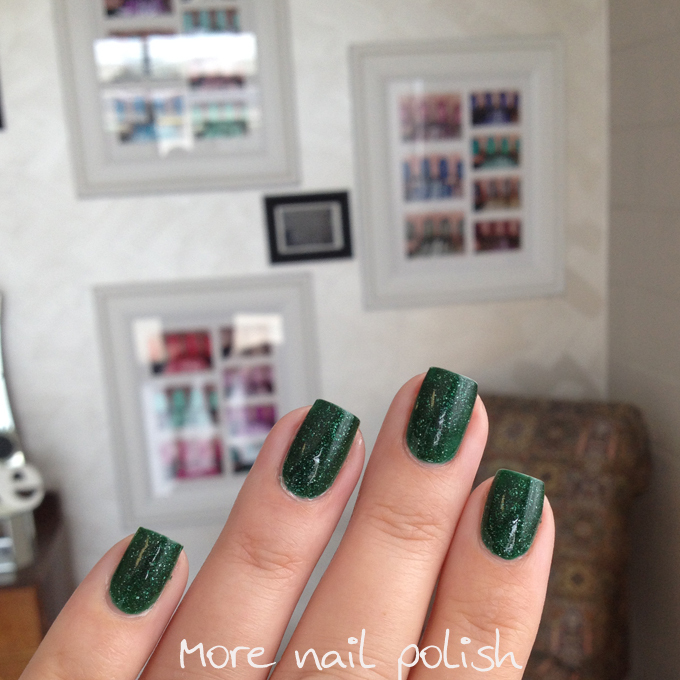 This is one coat of ariel's tale on each nail. As you can see, the new version has amazing glitter payoff. You could easily get full nail coverage with two coats. Just like with ariel's tale, mardi gras has under gone a reformulation and come out at the end with a much more densely packed glitter. This is one coat of mardi gras on each nail comparing the new formula on the index and ring fingers and the old formula on the middle and pinky. Whilst I was at the PPHQ I also picked up the latest collaboration shades. So stay tuned for some swatches and nail art incorporating those. 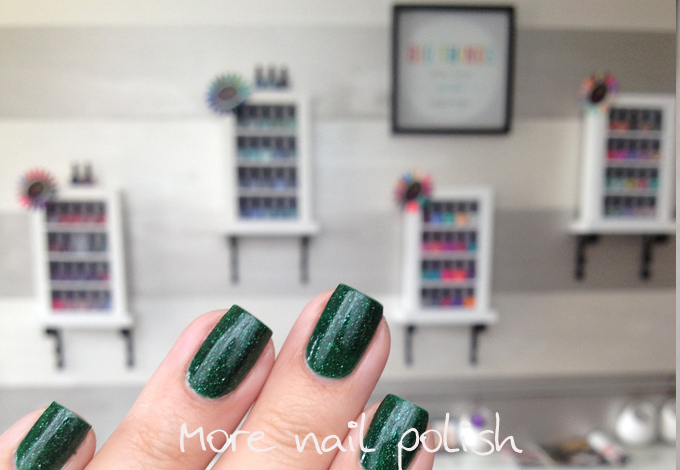 I also got to have a sneak peak a few polishes they are working on, including the new topper called Holiday. Holiday is a special release and contains the signature PP scatter holo flakies as well as the multi coloured flakies that are in Festival. The swatch I saw looked totally gorgeous, so I can't wait to get a bottle of that. Plus, Picture Polish will be stocking Liquid Palisade - I'm so excited for this. I've tried PVA glue and painters masking fluid with very average results, so I can't wait to try this!